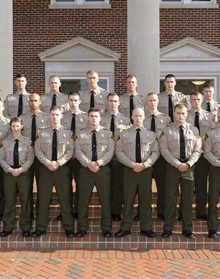 RALEIGH, N.C. (June 29, 2018) — Twenty-one cadets were sworn in as wildlife law enforcement officers by the N.C. Wildlife Resources Commission at a graduation ceremony held at Campbell University on Thursday. 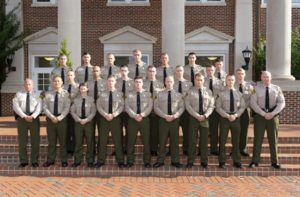 During the ceremony, which celebrated the Commission’s 55th Basic School graduation, each cadet took an oath to enforce criminal laws, including conservation and boating laws, and to faithfully and impartially execute the duties of a law enforcement officer in North Carolina. Each new wildlife officer will now begin six months of on-the-job training under the supervision of a veteran wildlife officer. Upon completion of field training, each officer will be assigned a permanent duty station. All wildlife law enforcement officer trainees are required to pass an extensive background, psychological and physical screening before entering an intensive accredited academy conducted by the Law Enforcement Division. The majority of the training is held at the N.C. Justice Academy in Salemburg. Officers complete conservation-specific training on fish and wildlife laws, motorboat accident investigation and protected species. Instruction covers statutory and investigation procedures, defensive tactics, fish and game laws, and pursuit driving and boating. The Commission’s Law Enforcement Division is now accepting applications for Wildlife Law Enforcement Officers for the 56th N.C. Wildlife Resources Commission Basic School. Visit www.governmentjobs.com f or more information.